Want to add a little glitz to your backyard in time for summer, but not sure where to start? Consider doing a few DIY mosaic tile projects to really help make your outdoor space come to life. Any one of these small changes can add a lot personality and color to your backyard. Not only are mosaic tile projects budget-friendly, but they’re also an easy DIY project that looks anything but low-grade. 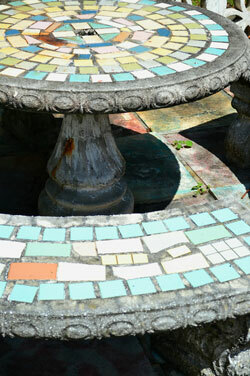 Mosaic tables are the perfect addition to any backyard patio or deck, and creating one is simpler than you might think. You will need a table, mosaic glass tiles, a hammer, mosaic glue, grout such as the TEC® Skill Set™DesignColor™Grout, used with Grout Boost Grout additive, a float, a sponge, and sealant. Break the mosaic tiles into small pieces using the hammer, lay out your pattern on top of your table, and then adhere the pieces to the table using mosaic glue. Allow to dry overnight. Consider using a color grout to add an extra pop to the table by selecting the right shade using the color selector tool, then mix and apply to the table, using the float to spread into the spaces between the tiles. Wipe off excess grout from the tile using the sponge, allow to dry, and use the sealant to seal the grout to prevent it from becoming pliable in the future when wet. 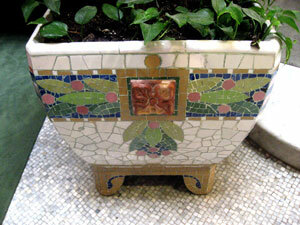 You’re now all set for your morning coffee seated at your new mosaic garden table. Not only does having a bird bath help provide the daily supply of water necessary for a bird to sustain life, but it also is the ideal way to observe wild birds from the comfort of your own backyard. 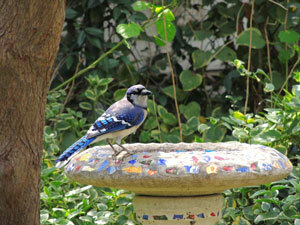 Take some time to create a mosaic bird bath that will really hasten the call of the wild. You will need a terra cotta saucer, terra cotta sealer, mosaic tiles, mosaic glue, grout, a sponge, and an outdoor sealant. Using a clean terra cotta saucer, seal its surfaces with a terra cotta sealer, allow to dry, and then glue mosaic tiles to the saucer using mosaic glue. Allow the tiles to dry in place for 24 hours, then mix your grout (perhaps even using a colored variation determined by using the color selector tool) and apply to the saucer, pressing between all of the pieces and smoothing with your fingers. Allow to dry, and then wipe off excess with a wet sponge. Allow to set for 24 hours, and then seal with an outdoor sealant. Now watch as your garden oasis becomes a haven for birds on-the-go. Who says you have to walk on dirt? This creative and fun DIY mosaic tile project is a seamless way to brighten up your walking path and add a bit of glimmer to the ground. You will need a plastic basin, mosaic tiles, kraft paper, mosaic glue, concrete mix, (prepared immediately before pouring), and an outdoor sealant. Cut the kraft paper according to the shape of the bin, sketch your design on it, and place tiles on the paper. Glue the top portion of the tiles to the paper so that the back side is facing up, then place in the bin and mix concrete. Pour the liquid cement over the mosaic tiles to your desired width. Allow to dry for a day or two, remove the mold from the basin, and peel the kraft paper off of the mold. Wipe off any excess glue, and seal with an outdoor sealant. 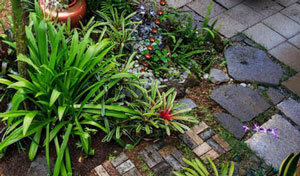 Place your new stepping stones in your garden for a little mosaic magic pathway. Saturday afternoons spent sipping lemonade on the back porch are just around the corner. Why not add a little shimmer to your spread with DIY mosaic outdoor coasters? You will need mosaic tiles, mosaic glue, grout such as the TEC® Skill Set™DesignColor™Grout mixed with Grout Boost, a sponge, sealant, and coasters. Apply a layer of mosaic glue to your coasters, then apply tiles in the pattern you want. Allow to dry, then apply grout and let sit. Wipe away excess with a damp sponge, then apply sealant. Use your new mosaic coasters at your next outdoor bash or simply while flying solo and enjoying a cold beverage while taking in some rays. DIY mosaic flower pots are your garden jewels, adding just the right amount of sparkle to your outdoor space. Use them as centerpieces on your backyard picnic table, or line the backyard pathway with them to add a touch of elegance. You will need mosaic tiles, a hammer, thinset mortar, a terra cotta flower pot, grout, a float, a sponge, and outdoor sealant. Break your mosaic pieces with the hammer, then apply a layer of thinset mortar to the terra cotta flower pot and place tiles, allowing to dry overnight. Mix the grout and apply evenly (you might even want to try a colored grout determined by using the color selector tool), and use a float to spread. Remove excess using a damp sponge, allow to dry, and then seal. Plant your favorite flowers in your new pots, and watch as their vibrant colors accompany the rich hues of your decorative piece. Campouts wouldn’t be half as fun without roasting marshmallows by the open fire. Why not bring a little bit of the Great Outdoors to your own backyard by utilizing your old fire pit? Start by giving it a refresh that will leave guests in awe. You will need mosaic tiles, a hammer, mosaic glue, groat, a float, a sponge, and outdoor sealant. Break apart your mosaic tiles using the hammer, then lay out your design and apply to firepit using mosaic glue. Allow to dry overnight before grouting (consider using the TEC® Skill Set™DesignColor™Grout mixed with Grout Boost), remove excess with a damp sponge, and seal. You’re now the proud owner of the most stylish fire pit in the neighborhood. For more summer and backyard mosaic inspiration, visit our Pinterest page. To find more articles like this one, subscribe to our blog.